Earlier this year NLEA announced that the Village of Central Lake was working on an application for a Community Development Block Grant (CDBG) from the Michigan Economic Development Corporation (MEDC) to install five new permanent docks in Thurston Park and construct a 40’x70’ pavilion with adjacent public restrooms and a storage room totaling 21’x19’ on the corner of North and Main Street. Project activities also include: installation of a water and sewer line for the restrooms, tree removal at the pavilion site, and preparation of the pavilion parking lot. In May, the Village was officially awarded over $250,000 to complete this project. Gourdie-Fraser out of Traverse City has played an important role helping to finalize the engineering and design for the docks. The first part of this project, five new permanent docks, is complete. Residents and visitors of Central Lake will be able to enjoy these docks year-round. 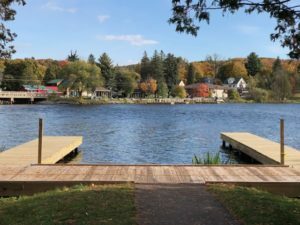 Next spring Gourdie-Fraser will continue to work with Village Council to complete the design and plans for the new pavilion and restrooms, looking to construct by early fall. Stay tuned for pavilion updates. The MEDC offers a variety of opportunities and grant programs for more projects than just façade work. To learn more about community development block grants contact the NLEA at 231-582-6482 or info@northernlakes.net.